A Note on the author: Shiv K. Kumar (born August 16, 1921) is a distinguished poet, novelist, short story writer, playwright, translator, academic and critic. He has published thirteen volumes of poetry, five novels, two collections of short stories, a play and a dozen books on literary criticism. Following stints as a lecturer and as programme officer at the All India Radio, he obtained his doctorate in English Literature from the University of Cambridge (~ here he was also tutored by the influential British critic F.R. Leavis). Kumar has been an academic, teaching British and American literature in India and abroad, for about four decades. In 1978, he was elected a Fellow of the Royal Society of Literature (FRSL), London. ~ Several of his poems and short stories have been broadcast over the BBC, and published in various widely-read journals, newspapers and magazines - like the New York Times, Poetry Review (London), Western Humanities Review, among others. He received the Sahitya Akademi Award in 1987. In 2001, he was awarded the Padma Bhushan for his contribution to literature. It recounts the tale of Gautam Mehta, a journalist in Delhi (assistant editor of The Challenge) - and the novel's quick-witted protagonist, alongside enameled snuffboxes, and hobson-jobson conversations ~ as India made its tryst with destiny. Mehta arranges a quick divorce from his adulterous wife ~ by convincing a naïve Bishop and converting to Christianity. [However, during the simple ceremony, and before Father Jones sprinkles holy water on his head and shoulders, Gautam is particularly touched by a passage from Joshua in which Moses asks his followers to cross the river Jordan into the land of new promise. "Wasn't he too about to cross over to freedom!" He is also struck by the dignified manner in which the ceremony was conducted - including the bishop's prayer wishing him happiness - nobody was "mumbling incomprehensibly all the time."] ~ The Delhi of 1947 is chaotic and restless; despite the proficient Commissioner Thornton at the helm, there is considerable lawlessness. Gautam finds a dead man, and learns that the deceased was in search of his abducted daughter Haseena who had been kidnapped in Allahabad, and sold into flesh trade (in Delhi). This disturbs him, especially since he finds a striking resemblance between the deceased, Abdul Rahim, and his own father, Shamlal Mehta, ("the same arched eyebrows, the same chiseled chin and nose.") ~ Later, after sharing a bottle of champagne and some pakoras, followed by a supper of seekh kebab, raita, nan and some fried chicken at the Neel Kamal, his best friend Berry (Birendra Dhawan) suggests availing the services of a lady of the night to celebrate Gautam's divorce. Sensing his hesitancy, Berry playfully teases him as 'Knight-saviour' and 'Gautam Buddha'. ~ Somewhat reluctantly, Gautam negotiates with the pimp... and ends up (at the Bridge Hotel, run in close partnership with Neel Kamal) with a hauntingly beautiful Muslim woman of quiet dignity - Haseena. ~ Gallant Gautam introduces himself and informs her about the deceased man. Thereupon, they embark on an elaborate plan - to help the damsel in distress escape the clutches of the pimp (which the protagonist-hero compares to a concentration camp). With the help of Berry - who by now has adopted Haseena as his sister-in-law - they manage to get away from the villain/pimp (who is in hot pursuit) and are soon on the train to Allahabad to see her family. The rest of the story involves Gautam explaining the situation to his family, meeting Haseena's family (and asking their permission for marriage ~ in the process becoming Saleem Gautam); his one-on-one with the villain/pimp; their attempts to steer clear of the discord and antagonism; Gautam attending Gandhiji's meetings and prayers (concluded with a rhythmical hand-clapping and head-swaying to the Ramdhun); Berry's dalliances; snippets of the twilight of the Raj, and so on. Gautam - with the help of Berry's British connections - also arranges for (expedites the process, that is) the immigration papers... of Haseena's family (her mother - Begum Rahim and younger sister - Salma), and then escorts them safely to Wagah. Haseena, of course, stays back. (However, given the disquiet, they all travel up to Wagah under assumed names: Begum Rahim as mataji and Salma as Durga, while Haseena and Gautam sees them off as Seema and Gautam respectively.) ~ All in all, the novel ends on a strong note of spiritual universalism, optimism and humanism ~ that of a people having a definite past, their present somewhat disturbed by partition (of the sub-continent)... but that the future is possible. Among the secondary cast of characters, Shamlal Mehta (Gautam's father) is relatively well delineated. ~ After his divorce Gautam moves in with his parents, into their small house at Anand Parvat. His father, a former Arya Samaji, initially assumes a somber expression on learning about Gautam's conversion - for the sake of easy divorce. But finally responds (as an indulgent father) with: "Maybe Christ too was a yogi, a real karma yogi," and then proceeds to argue his point. When Gautam counters, "But Christ died on the cross, nailed and bleeding till the end. Stone-dead he was when they pulled him down." Shamlal responds with, "No, my dear, Christ didn't die on the cross," ..."He was left there unconscious by the Romans as 'stone-dead' and buried later. But now I earnestly believe that being a yogi, he had controlled his organs, had sort of anesthetized himself before they nailed him on the cross. And since he went into a deep Samadhi, a yogic trance, he felt no pain - nor did he really die, so, he rose from his grave after a brief spell of what I think was a kind of subterranean meditation. That was the Resurrection!" ~ Shamlal later tells the Bishop (with a straight face) ~ that he has now come to believe in Christ as another manifestation (avatar) of Vishnu. ~ There's the bit about insipid British food - steam-boiled Brussels sprouts, mashed potatoes, and scrambled eggs. An Englishman's perennial obsession with weather too is woven in quite neatly. 'Any other Indians coming?' Berry asked. My twopenceworth: Written with the Partition (which was a rather complex phenomenon) as the temporal setting, the author does try to portray a realistic picture of Allahabad and Delhi of that era. He has also attempted to weave the various aspects of partition (cultural, historical, spiritual, emotional, economic, and so on)... apart from the political/geographic division of the country into the texture of the novel. The Gautam-Haseena track provides a strong romantic tinge/motif through the story - though the eponymous train journey probably is an allegorical one, since in the book it takes up all of ten pages. The novel is more of a novella... and quite crisp; editing is decent, the language is simple and easy to understand, and so the story rolls along quite well, but the narrative sometimes meanders on. Gautam's character is reasonably well-etched, however, there is scope for improvement; the other central character, Haseena, comes across as uni-dimensional - so, plenty of space for improvement here as well; the secondary characters too could have done with some more exploration, fleshing-out and insight ~ to move the story along more succulently and cohesively. Maybe a better mix of drama, history and romance coupled with a sustained flow of satire and comic relief could have turned a great story into a great read. 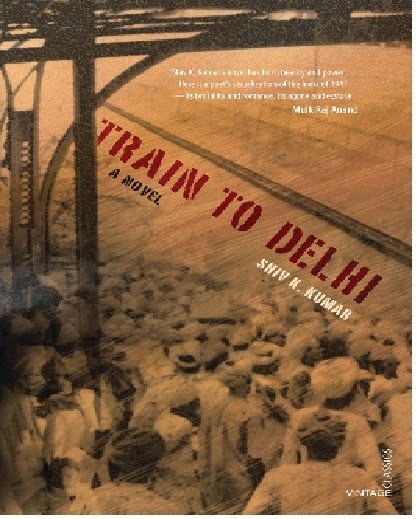 Details of the book: Train To Delhi/ Author: Shiv K. Kumar/ Publisher: Vintage Classics, an imprint of Random House India/ Binding: Paperback/ Language: English/ Publishing Date: 1998, 2013/ Genre: Fiction/ ISBN-10: 978-81-8400-396-3/ ISBN-13: 9788184003963/ Pages: Approx 250/ Price: INR 299. Picture: The book jacket cover of Train To Delhi. Courtesy: randomhouse.